To mark the launching of a series of celebrative events of the school’s 45th anniversary, ‘Sea Land Air Kick-off Ceremony’ was successfully held on 5 January, 2018. We were honoured to have Ir. Lo Kok Keung as our Guest of Honour. Ir. Lo is reputed as ‘Hong Kong Detective Galileo’ being Expert Witness Testimony on Traffic Accident, Mechanical and Marine Engineer. Before his retirement, he worked in the Department of Mechanical Engineering, The Hong Kong Polytechnic University. We were also honoured to have Ms. Leung Kin Yi, who is a Senior Lecturer from Division of Mathematics and Science Education in Faculty of Education in the University of Hong Kong as our Guest Instructor. The Ceremony was officiated by Ir. Lo Kok Keung. In his speech, he hoped that STEM education could raise students’ interest in learning and nurture talents in the field of science and technology, contributing to the society. Followed by Ir. Lo’s speech was the building of pyraminx installation designed by our students. It was chosen to be a symbol for our 45th anniversary because solving a rubik’s cube is an imitation to the solving of problems in life. With a daring heart and persistence, we can surmount all obstacles and together bring an overall improvement on life and our society. In the ceremony, Ir. Lo, Guest of Honour, Ms. Leung, Guest Instructor, School Supervisor, School Managers, Principal, representative of Alumni Association, teachers, House Captains, Chairperson of Students’ Council, Head Prefect, Scout Leaders, representative of Guidance Prefect, representatives of graduating classes and F.1 students joined hands to build the installation. The climax of our kick-off ceremony was ‘Together We Fly- Paper Aircraft Blast’. In preparation of the event, all students attended ‘STEM Lesson for All (Paper Aircraft)’ conducted by Dr. Tong Shiu Sing Dominic on 21 December, 2018. Students of the STEM team has put in great effort in specially designing and making new robotic cars to transport the air-crafts folded by Ir. Lo to our stage parties under the instruction of Ms Leung Kin Yi and her team from the Division of Mathematics and Science Education of the Faculty of Education of The University of Hong Kong. 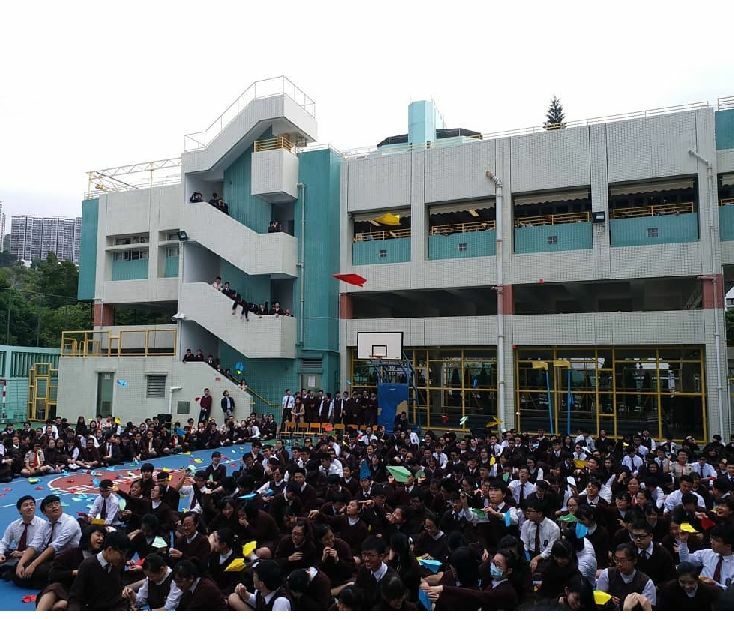 In the paper plane blast, a total of over 1500 paper crafts made by our students and teachers flew into the sky above our school campus at the same time, commemorating our school’s 45th anniversary and dedicating our school and ourselves to embrace the upcoming challenges with courage and hope.